Former New York State resident, now Floridian, Neil Wilson hunts with Alberta’s Venture North Outfitting for the bow hunt of a lifetime. 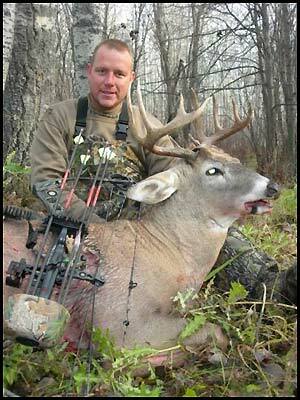 Here is a first-hand account of his October 2006 archery whitetail hunt. I’ve been an avid whitetail bow hunter for over two decades. During that time, I’ve spent countless hours on stand in upstate New York. I’ve been fortunate enough to enjoy many successful deer seasons but like a lot of bowhunters I was becoming frustrated with the growing density of hunters and urban sprawl. Likewise, the trophy quality of deer in NY is poor. So my thoughts turned North. I’d heard about the great whitetails in Alberta Canada and wanted more than anything to hunt there. It all started last January when I mentioned to my wife Courtney, that I wanted to hunt somewhere different. A place where I would have a good opportunity to take a trophy-class buck. She knows how passionate I am about hunting, and much to my surprise, she secretly researched outfitters on the Internet. She’d heard me talk about the monster whitetails in Alberta, so she began there. Not knowing anything about hunting (or Canada for that matter) she started contacting outfitters. Courtney’s plan was to surprise me by booking the bow hunt of my dreams! After many hours of research and phone calls, she narrowed her choices, but because of the expense, she figured it would be best to disclose her plan ahead of time. Needless to say I was ecstatic! We ended up booking with Venture North Outfitting in Edmonton, Alberta for two reasons: First, because the outfitter (Kevin Wilson) was very responsive to our questions and second; he seemed to take his business very seriously and professionally. The trip included pick-up and drop-off at the Edmonton airport and everything in between. Kevin’s philosophy is that he’s in the adventure tourism business and hospitality is part of the game. He and his staff know bow hunting and he is very good at what he does. Courtney planned to accompany me on my bow hunt for the rest and relaxation. We’d booked out trip for the last week in October. Kevin suggested that this was one of his favorite pre-rut weeks and that they often rattled in multiple bucks at that time. Now, all that was left was the waiting. On October 22nd we arrived at the Edmonton International Airport. The first thing I noticed in the baggage claim area were two enormous bronze whitetail statues. This was symbolic of what this trip meant to me. As quickly as euphoria set in, it was quashed! As I reached out to retrieve my bow case my worst nightmare became a reality. It was damaged. I feared the worst. We had traveled 3,000 miles for the bow hunt of my dreams, and didn’t need any complications. Thankfully, when I opened the case, everything appeared to be intact. Shortly after exiting Customs, Courtney and I met Kevin and Max Berger from Massachusetts. Max was a repeat client now on his fourth trip with Venture North – a positive endorsement. It was as though I’d known Kevin my entire life. With Courtney on her own for the week, we rented a car and followed Kevin to the lodge. It was sinking in. This was the place that we would call home for the next six days. The lodge was incredible. It overlooks the North Saskatchewan River and a breathtaking view. Huge 150-170" deer heads were hanging in the gathering room and further fueled my anticipation. It was late afternoon, not time to hunt but enough daylight for us to check our bows. I assembled my equipment, set up for a 30-yard shot and launched an arrow. A near perfect heart shot on the 3D deer target. Good karma. I took several more practice shots from a deck 15 feet off the ground before heading inside for a home-cooked meal and retiring for the night. Sleeping was tough. I was too excited. Anticipation kept me up like a kid on Christmas Eve. The alarm rang at 4:00am; time to get ready for my first big day in the Alberta woods. The weather was rough for our first day. We loaded all of our gear into Kevin’s truck and headed to the stands. They had been hung days before our arrival and Kevin gave both Max and I an explanation of what to expect at each of the stand sites. Kevin knows each of the properties intimately and has a very good understanding of the deer that inhabit those lands. Through scouting he understands how to hunt each of them. A highly accomplished bow hunter himself, Kevin believes in setting stands within 20 yards or less of major trail intersections. With no bow hunting pressure from resident hunters, we each had several hundred acres of land to ourselves. This was a bowhunter's dream! Max was dropped off first and now it was my turn. I really got excited when Kevin told me that a hunter from Pennsylvania had killed a 180-inch non-typical and watched an even bigger buck from my stand the year before. To keep from disturbing the deer, Kevin believes in parking his truck some distance from the actual tree stand location and walking for what seemed a half mile. Kevin made sure I was tucked into my tree, gave me a handheld radio with instructions to check in at a designated time, and then left me to hunt. The first day was challenging. I sat in the tree all day. Thinking about the opportunity to arrow the biggest buck of my life kept me going. As the first couple days came and went, I saw several deer, but no big bucks. Before Wednesday’s hunt, Kevin and I discussed options and decided to change stands. I sat in a tree about 18 feet high with trails heavily beaten down by deer traffic. Just after sunrise, I saw a large 10-pointer walking 35 yards away. I attempted a shot but the arrow sailed harmlessly over his back. It was a clean miss. I saw between 10 and 15 other deer that day, but none were shooters. Then it happened. On Friday morning around 8:15 am, I saw the same buck that I missed on Wednesday; however, this time he walked right under my stand. Unable to shoot, I stood up and attempted to reposition myself. As I stood the buck spooked and ran 15 yards. He stopped in heavy cover. I pulled out my doe bleat and tried to coerce the buck back to me. My doe bleat malfunctioned. It would only emit a low pitched moan! I was thinking to myself, “this can’t be happening!” All I could do was watch the buck walk slowly through thick cover. Disappointed, I sat back down. It was then that I spotted an even bigger buck. He was sneaking in to inspect my low pitched bleat moan. He was curious and walked right to me offering a quartering away shot at 13-yards! I was now at full draw. 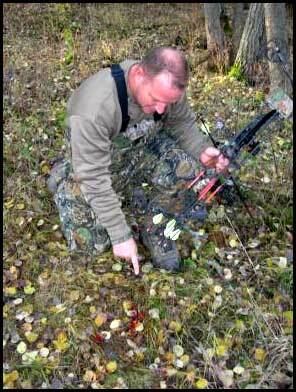 Using 380 weight ACC arrows armed with a 100 grain Muzzy broadhead, I released. The arrow flew like a bullet until I heard a loud thud. The arrow hit hard and the buck took off like lightning! I watched until my buck disappeared from view a hundred yards away. My heart was racing uncontrollably. I waited 40 minutes before calling Kevin on the radio. By the time Kevin reached my stand over an hour had elapsed. I immediately relayed the story and showed him where I arrowed the deer. We were both happy to see a lot of blood. The blood trail was so easy to follow that we could walk at a reasonable pace. Kevin felt confident that we would find the buck dead right around the corner. The amount and color of blood appeared to indicate a lung shot. Then, after 100 yards, the unthinkable happened – the blood trail just stopped. Completely puzzled, Kevin and I stood there for a few minutes considering our options. Resuming our search, Kevin asked me to scour the last area that we’d seen blood and he proceeded to move along a game trail that he felt was the most likely direction of travel. Within minutes, I located my arrow and we picked up the trail. It wasn’t looking good. Blood was inconsistent, stopping and starting as we continued our search. After another fifty yards, Kevin suddenly motioned to me. He had spotted my buck in the middle of a clearing and it appeared to be in rough shape. As we watched my buck lay down, we again contemplated options. For about 10 minutes we watched the deer. Kevin told me I would have to put one more arrow into the deer. Easing in, we took our time to get 20 yards away. The buck was bedded behind a fallen tree and all that could be seen was his head and antlers sticking up from the tall grass. Kevin instructed me to move into position for a shot and reminded me that this might well be the most important shot I would ever make. I gained another five yards. When the buck finally realized I was there, I had no more time and had to take the shot. I hit a branch on the fallen tree! At that point the buck jumped to its feet and attempted to escape. He was only able to run another 30 yards before collapsing. I shot a final arrow through his chest. It was absolutely the most intense bow hunting experience I’ve ever had. 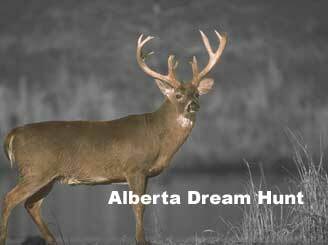 Kevin congratulated me and we spent some time photographing my first Alberta whitetail. The deer weighed approximately 260 pounds dressed and was a perfectly symmetrical 10 pointer. There are much bigger whitetails in that area and I’m already planning my next trip with Kevin to see if I can anchor an even larger trophy whitetail. Neil poses with his first Alberta Whitetail - it won't be his last! The entire experience, from the accommodations to the hunt itself, is one that I will always remember. Kevin Wilson has a passion for bowhunting and is truly a professional that loves his job. I would recommend Venture North Outfitting to any bow or gun hunter. It truly was a hunt of a life-time. For more information, or to book a hunt with Venture North, they can be reached at 780.913.1021 or visit their website at www.venturenorthoutfitting.com.